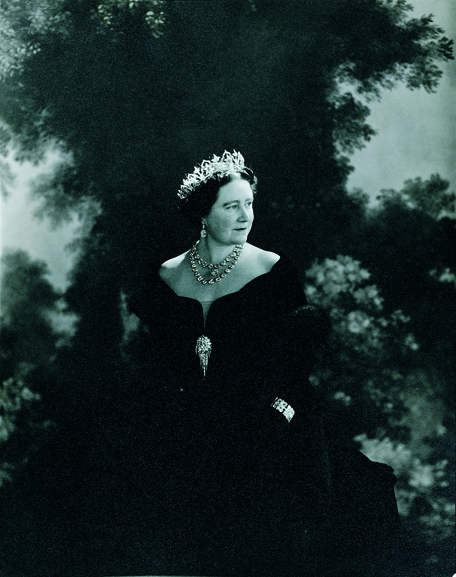 Today's tiara happens to be my personal favorite example of Prince Albert's keen eye for design. He oversaw the creation of many wonderful pieces for his wife, Queen Victoria, including this piece made by Garrard in 1853 for around £860. The design of this tiara may have been inspired by a collection of Indian jewels which were given to Queen Victoria a few years before. There certainly is a distinct feel to the piece created by the Moghul arches and lotus flowers present in the design, hence the "Oriental" in the name. The "Circlet" portion of the name comes from the way the tiara wraps itself nearly all the way around the head as a circlet would. It's a big tiara: the original diadem consisted of more than 2,600 diamonds with opal accents, all set in gold. 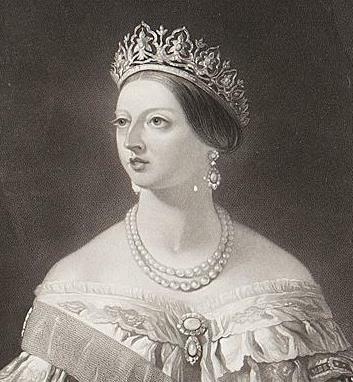 Opals were one of Albert's favorite stones, and after receiving this tiara Victoria commissioned an opal necklace, earrings, and brooch to go with. 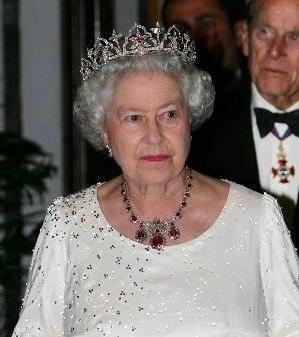 The opals have since been replaced with rubies (and you will accordingly sometimes see this referred to as the Indian Ruby Tiara or even just the Indian Tiara). Many changes have occurred since the tiara was created. For the initial design, Victoria supplied around half of the diamonds from her existing collection - some of which were once set in jewels owned by Queen Charlotte. The ownership of Queen Charlotte's jewels was disputed by Victoria's relative the King of Hanover, and when it was decided that they rightfully belonged to Hanover this tiara had to go back to the workshop. The Hanover diamonds were removed in 1858 and replaced by a mix of diamonds taken out of other royal jewels and new ones from Garrard. Queen Victoria left this set to the Crown in her will, and when Queen Alexandra inherited it after Victoria's death she changed it again. Apparently believing opals to be unlucky, she replaced them with rubies from a necklace given to Queen Victoria by the ruler of Nepal. She also reduced the size of the tiara: there were originally 17 opals and arches, but only 11 rubies and corresponding arches exist on the piece today. That's actually quite a significant change. Additionally, the original ledger page from Garrard's notes that parts of the tiara were removable to be replaced with "large single diamonds" for "when a lighter and more simple tiara is required". I don't know that any image of the tiara in this simplified form exists, nor do I know if it could still be done after all these modifications - but I like the thought. For all the changes she made, the tiara doesn't seem to have been a favorite of Queen Alexandra - well, at least enough of a favorite to wear for portraits and the like - and the same goes for Queen Mary. It passed to Queen Elizabeth (the future Queen Mother) when her husband inherited the throne, and she finally made good use of the revised tiara. Despite having multiple tiaras to choose from, the Queen Mother used only two in her later years - this one and the Boucheron Honeycomb Tiara we now see on the Duchess of Cornwall. She often paired it with the magnificent set of huge rubies which was once set with opals, just like the tiara, and was also left to the Crown by Queen Victoria. When the Queen Mother died in March of 2002, the tiara passed to her daughter, Queen Elizabeth, along with the rest of her estate. This is one of the pieces that she technically could have asked for earlier - after all, it was left to the Crown, and she's been in charge of the Crown since 1952 - but she let it be, supposedly saying "Mummy will give them back." Queen Elizabeth debuted the tiara during a state visit to Malta in 2005 - and we've not seen it publicly since (despite my fervent wishes that she'd swap in this one and swap out the Burmese Ruby Tiara in her regular tiara rota). This is a huge, huge personal favorite for me and I don't typically go for the rubies. It's architectural, but not overly so; it's huge but not a monster. And it's just my kind of pretty, plain and simple. Does this make your list of favorites?